All Sherman tank production models and most of the TDs and ARVs based on the Sherman had an escape hatch right behind the co driver’s position. The location and size of the hatch stayed the same, but the ones installed on TDs seem to be different than the ones installed on tanks. None seem to have been hinged though, a common field modification was adding steel tabs to one side of the hatch so it doesn’t fall all the way out this was a common modification on both tanks and TD. This field mod was made a factory installation on at least the M36 B2. The escape hatch on early Shermans with a full turret basket was only really usable by the driver and co-driver. The driver would have to climb over the transmission to get to it, but the area was pretty large to get through. The reason the turret crew couldn’t use it, or it would be hard for them to use it, was the turret basket on early Sherman models it was fully screened in. There were openings, so the loader could reach the hull sponson ammo, but to use these, the turret had to be in the right place and not facing forward. 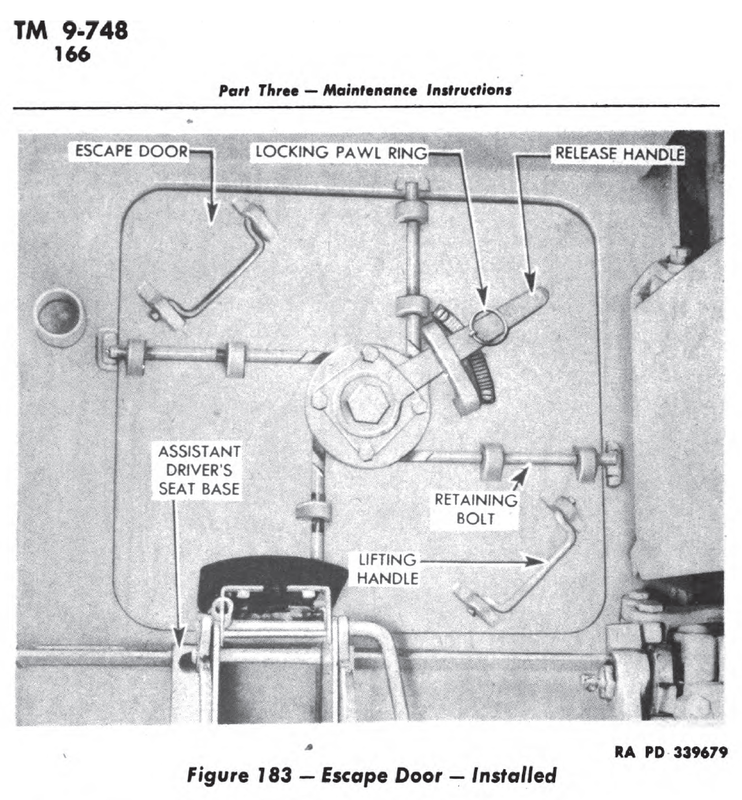 These openings, when turned towards the co-driver or driver would allow them access to the turret, or the turret crew to the hull. When they decided the initial ammo storage layout was too dangerous, they removed the screening, and the ready rounds, making access to the hull for the turret crew much easier, but there was still the turret basket floor, and the braces attaching the floor to the turret to get in the way. As the Sherman matured, the basket on the second generation Shermans was cut back to a half basket, and then eventually removed. Once this was done, using the floor escape hatch was much more convenient for the turret crew. The Shermans escape hatch was located just behind the 1-inch thick armor under the driver and BOG, where it was only half an inch thick. Far enough back there was not much of a chance of the crew being seen as they exit. The hatch was not used for just escape, I’ve read many accounts of the hatch being used to rescue wounded and or just pinned down men under heavy machine gun fire. The men would be told to lay still, and the tank would be directed onto them by the infantry in the area, in some cases one of them riding in the tank and when close the man on the ground would make sure the tank was going to straddle him and then waited to be run over. Once the tank was over the man, the escape hatch was dropped, the man pulled in and the tank would back out. This could be repeated as needed in the Pacific since in many cases the Japanese had nothing that could take on the Sherman locally. 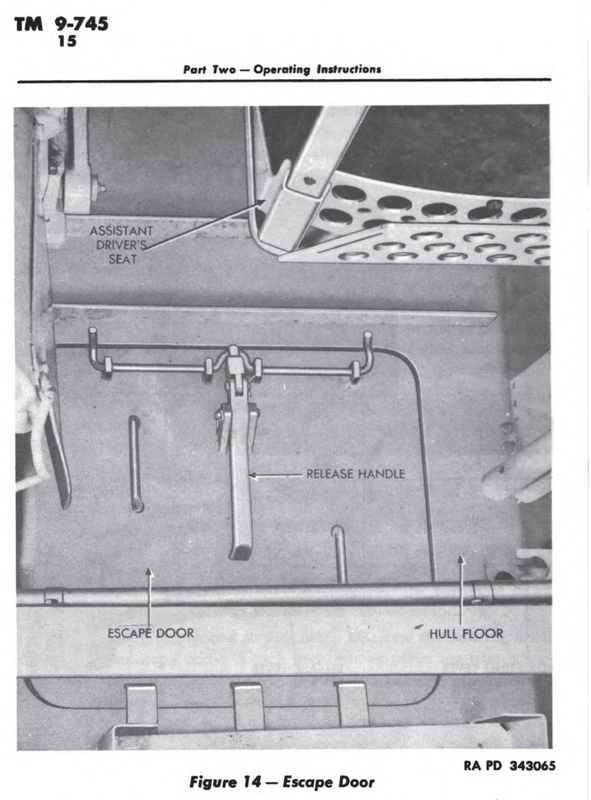 One final thought on the escape hatch, the reason it was fairly large and far back under the hull was that there were no torsion bars to worry about getting in the way. Later US tanks did have hull escape hatches, but they were usually further forward due to torsion bar use, and different driver’s location. You can see this on the M26 Pershing, where the escape hatches, there was one each for the driver and co-driver, were right under driver and co-drivers station. In some cases large mines could blow this escape hatches up into the crew compartment, injuring the driver or co-driver. This could take place on a Sherman, but no crew member was right over the hatch. 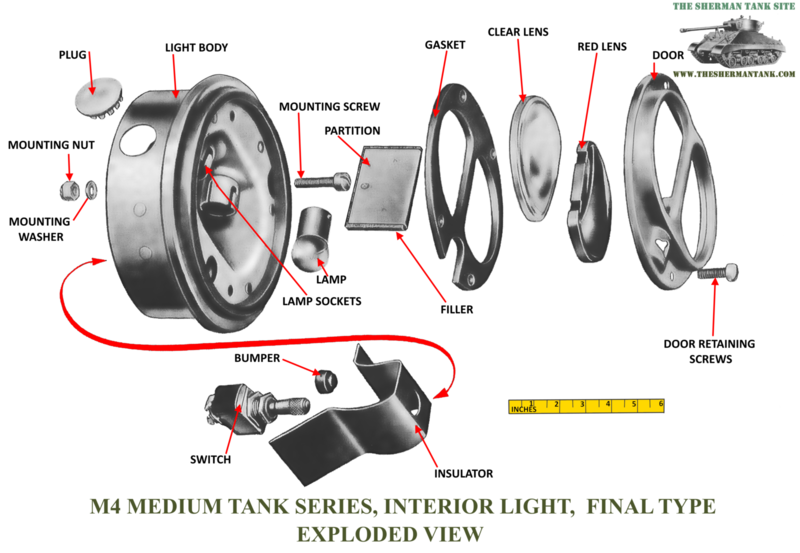 Interior Lighting: Because the Interior of a Tank is Dark, and People want to know About the Lights. 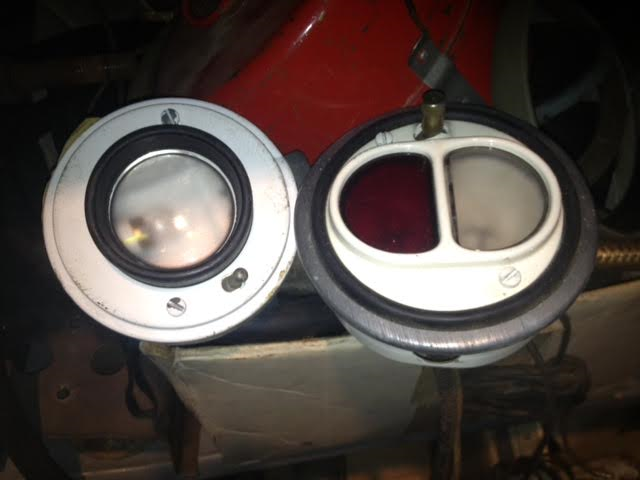 The early and late style Sherman interior lights. Thanks to Marc S over on the G104 mailing list! The interior of a Sherman tank is a pretty dark place, even during the middle of the day, particularly on the early models, when buttoned up. The only light would be what could come in through the various periscopes if they were open, or the DV ports on DV Shermans. On late model Shermans with the all-around vision cupola would be a little better but still not great. Opening the hatches and the pistol port, of course, helps a lot, but you can’t run that way when they are shooting at your Sherman. Now those clever engineers who designed the tank thought about this one, and they provided the early Sherman crew with three interior dome lights in the hull and four or five on later Shermans, and the instrument panel and compass were illuminated. 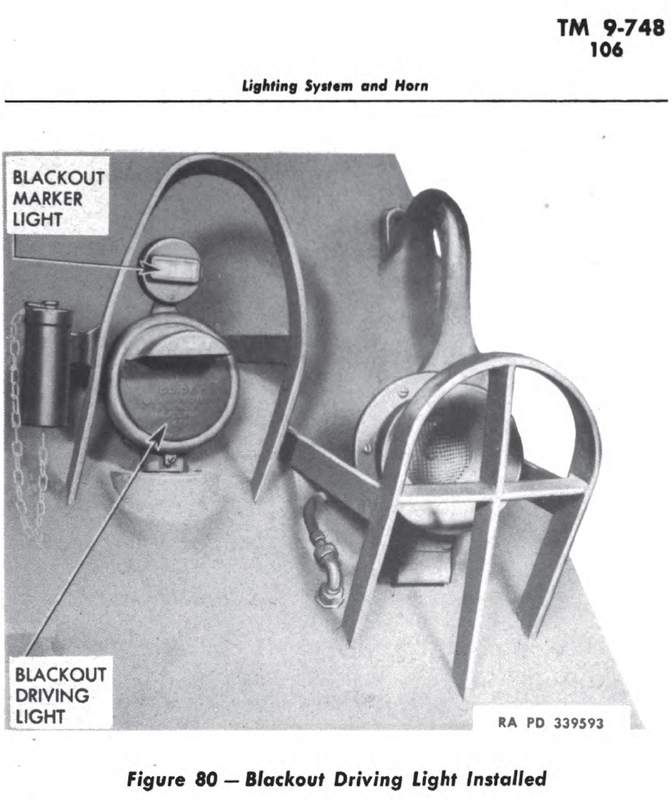 The turret had an additional one to two interior lights on early tanks, and three on later Shermans. These lights were all three candlepower. Early Sherman interior lights were white light only, but later ones had a red light as well to help with night vision. The lights are all in series with the master battery switch, so it must be on for them to work. Think 70s car dome light for brightness levels. 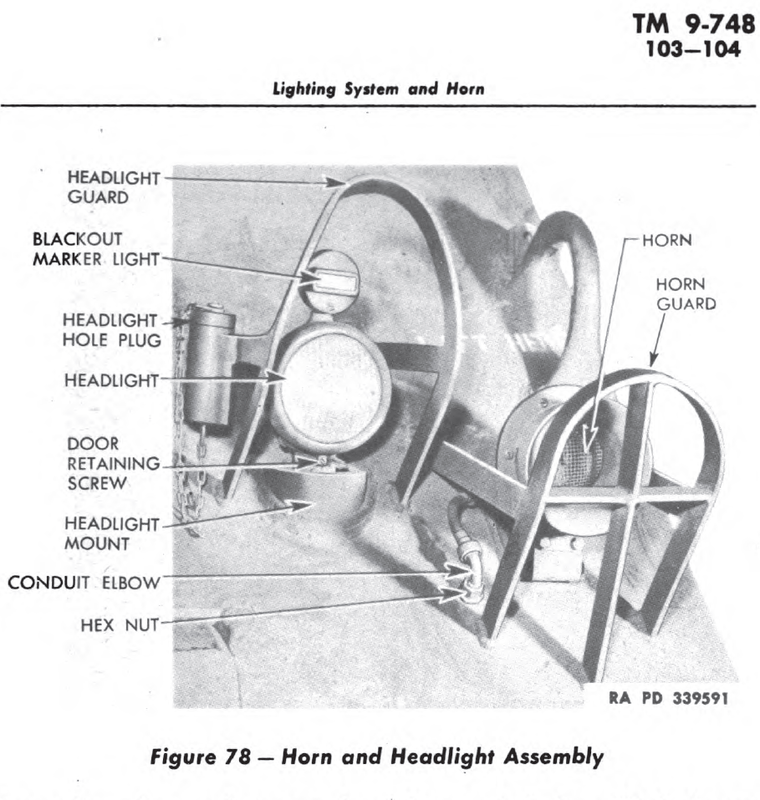 There was also a third interior light type, used only on 105 Shermans, that didn’t look the same, but I do not have a picture of it at this time. 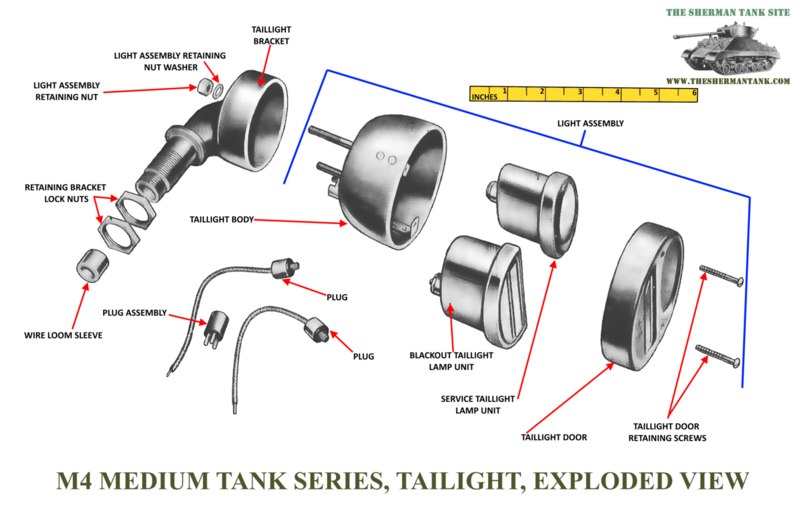 Exterior Lights: The Sherman Tank Had Those Too! The Sherman Tank had to drive on roads, sometimes in traffic, and at night. To facilitate this, the tank had removable headlights and taillights. 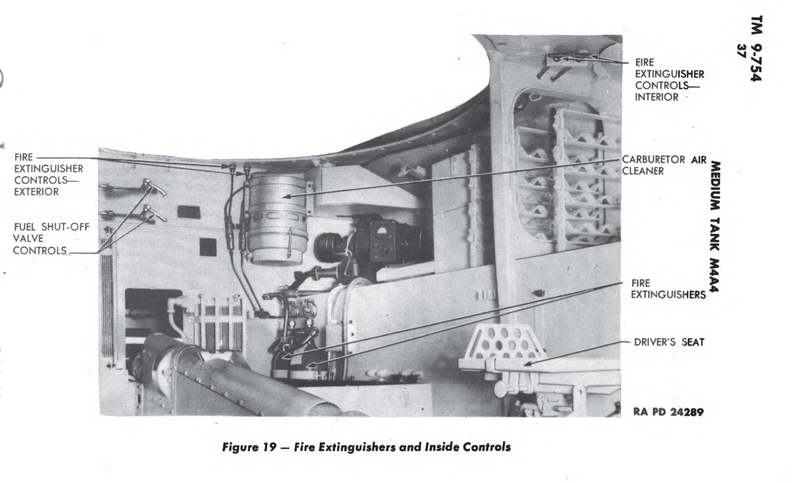 The later model Shermans also had provisions for an amiable, removable spotlight mounted on the top of the turret. 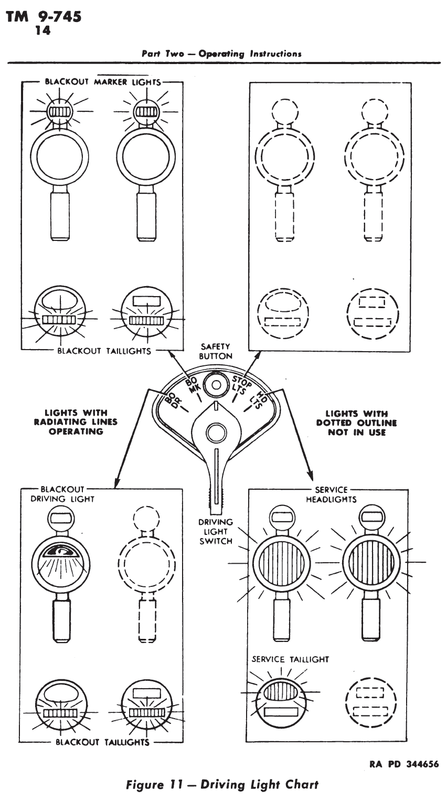 The Headlights came in two varieties, a regular headlight, and a blackout headlight, both had blackout markers. They would use the normal headlights anytime being observed at night was not important. If there was any chance of enemy observation, then just the blackout lights would be used. In extreme cases, just the black-out markers could be used. 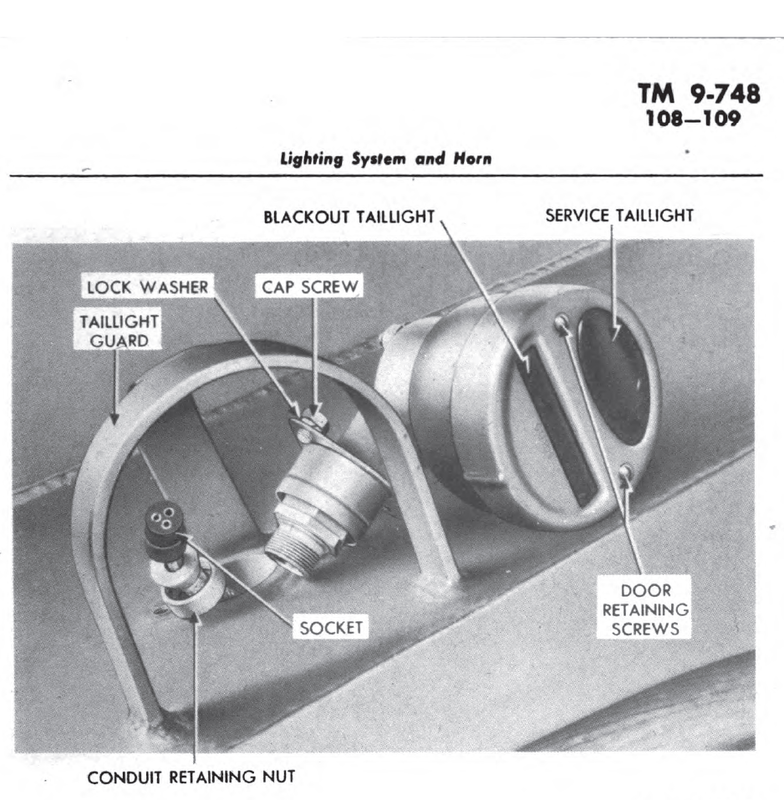 The tail lights were smaller than the headlights, and there was only one service taillight, and a pair of blackout taillights mounted in a pair of housings on the rear hull. Mid to latish production turrets and most 76mm turrets had a removable, paintable from the inside, spotlight added to the top of the turret. Many early Shermans that didn’t have the turret roof spotlight mount had it added during overhauls. 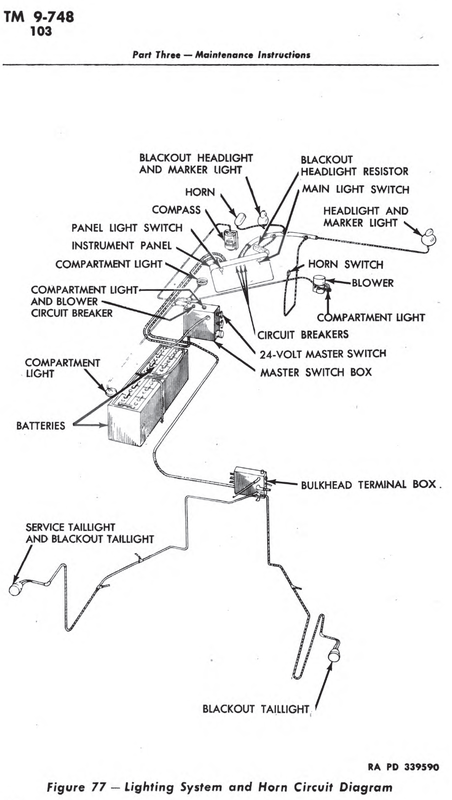 The headlights and taillights were controlled from the driver’s panel by a four position switch. 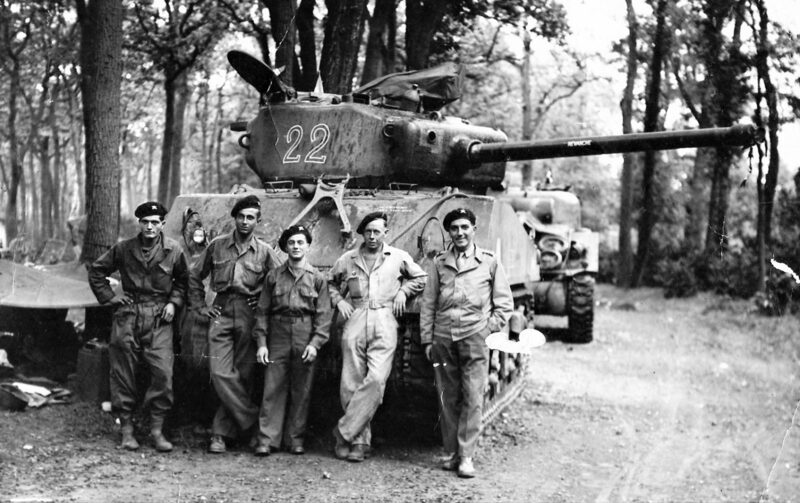 All the lights were removable, so they wouldn’t be damaged when the tanks went into combat. 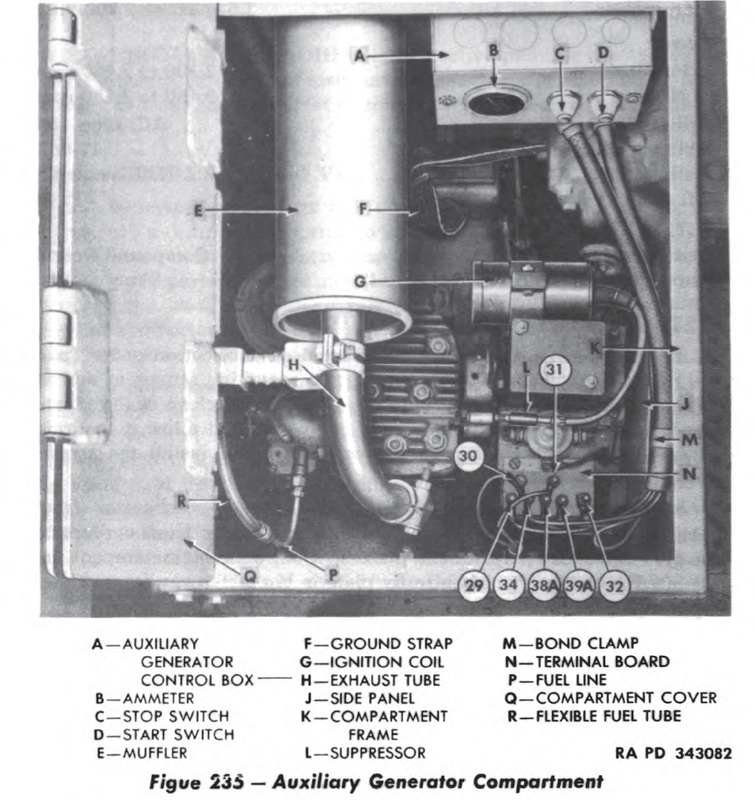 The Homelite Model HRUH-28: Was the exact model used in most Sherman based Tanks and TDs; the Army used this Aux Gen well into the 50s. Homelite also made other models for aircraft use, and they may have sold them commercially. There were a few differences in the installation, on early production Shermans, it was installed with a simple muffler that had an outlet at the rear of the vehicle, and the heat generated by the use of the generator was called an added feature, and was the tanks ‘heater’. Later versions had a ducting system that vented the heat into the engine compartment to help pre-warm the engine in cold weather or vented into the crew compartment to heat it. The ducting added about 15 pounds to the unit, for a total of 140 pounds. 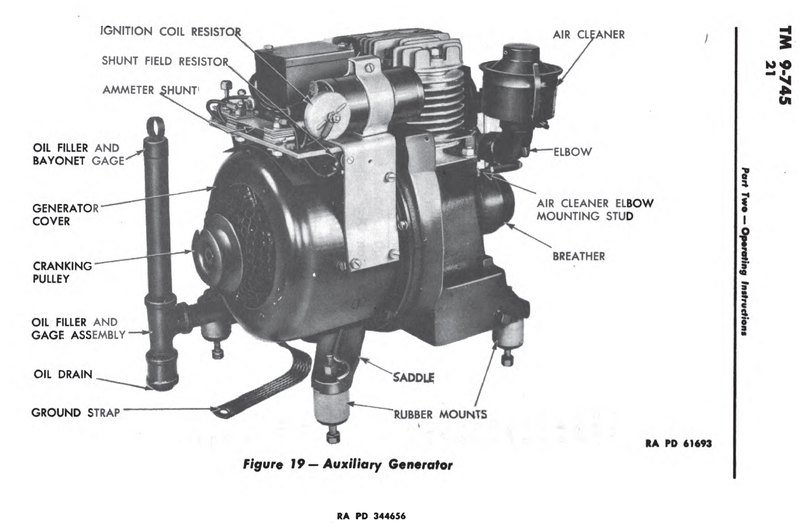 The motor that powered it was gas powered, even on the diesel tanks, and was a single cylinder, air-cooled, 2-cycle with a 2 3/8 inch bore and 2 1/8 inch stroke. It operated at 3400 to 3700 rpm and burned half a gallon of gas, mixed with oil for lubrication, an hour. It could be run on gas 80 to 100 in octane, used a magneto ignition and a forged rod, crank, and piston. The Generator could be started in two ways, if the tanks batteries had enough juice, it could be started by motorizing the Generator with the battery, or manually, with a supplied rope with a handle, on the starting plate. The Generator portion of the unit generated 1500 watts, DC, 30 volts. It was shunt-wound for battery charging. The Armature had a high-quality steel core and was laminated, impregnated and backed to give high resistance to oil, moisture, and dust. The field coils were made the same way as the Armature The whole unit, motor, and generator, used ball bearings throughout. Key for the above image. 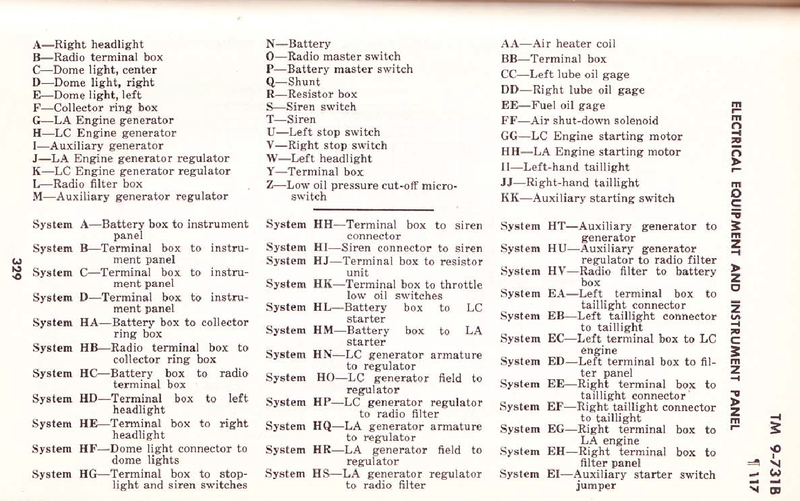 There was a short 10 item list of things the tank crew could do to maintain the auxiliary generator, and the final one removed it and put the new one/refurbished one in. 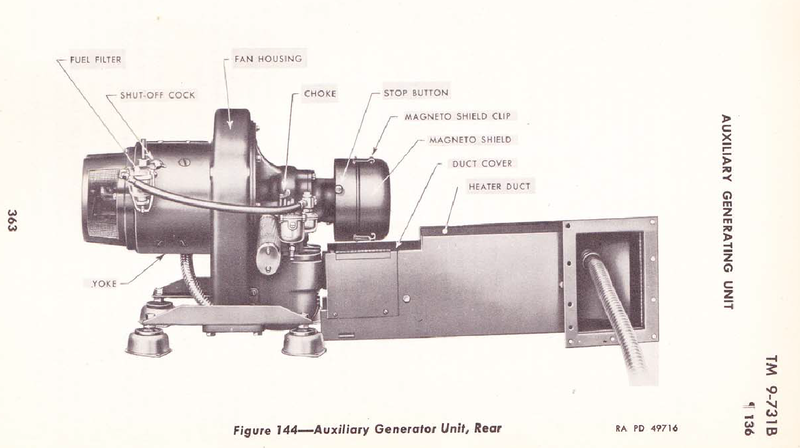 looking over the technical manual for the generator (TM9-1731K), and reviewing its construction, it was both heavy duty in construction and designed to give long trouble free service. The unit took the up rear part of the sponson on the driver’s side and had a dome light right near it on most Shermans. 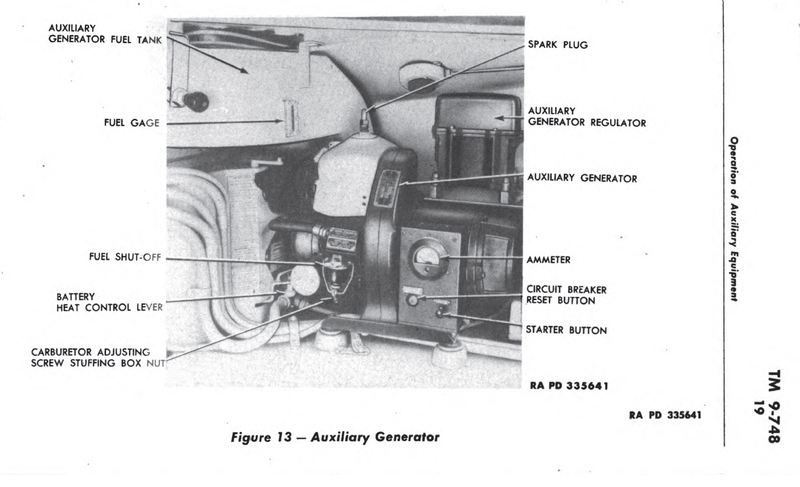 The Mystery Auxiliary Generator: When I was going through all the Sherman Technical manuals looking for info on the lights and Aux Gen, I found a few references to a model not made by Homelite. 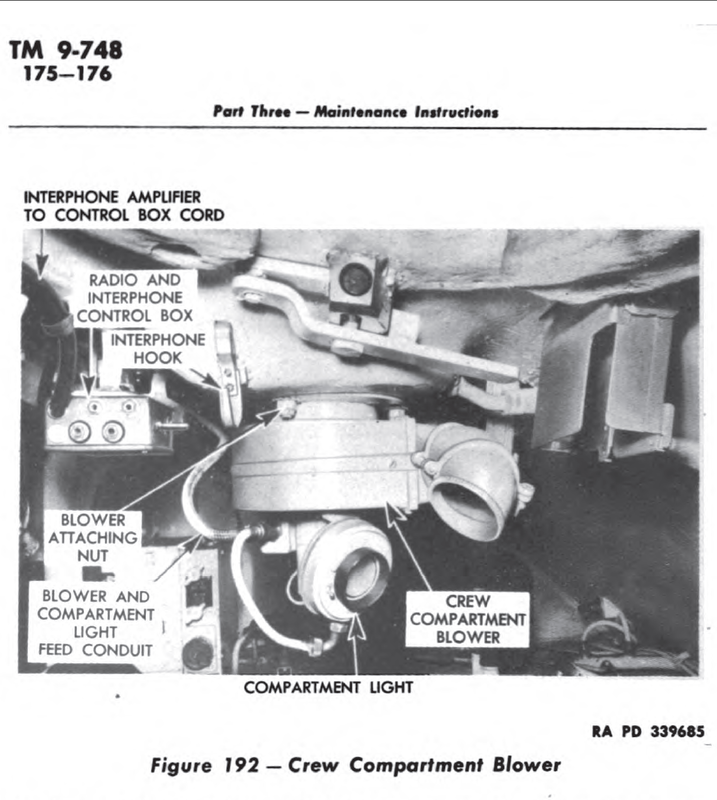 What’s interesting about this is, the Homelite tech manual is listed as a reference in most of the Sherman TMs that use it, but the mystery Aux Gen is not. I found most of the specifications for it but not everything and I found a few good pictures in the manuals, though one manual was useless in that area because it’s a horrible scan. 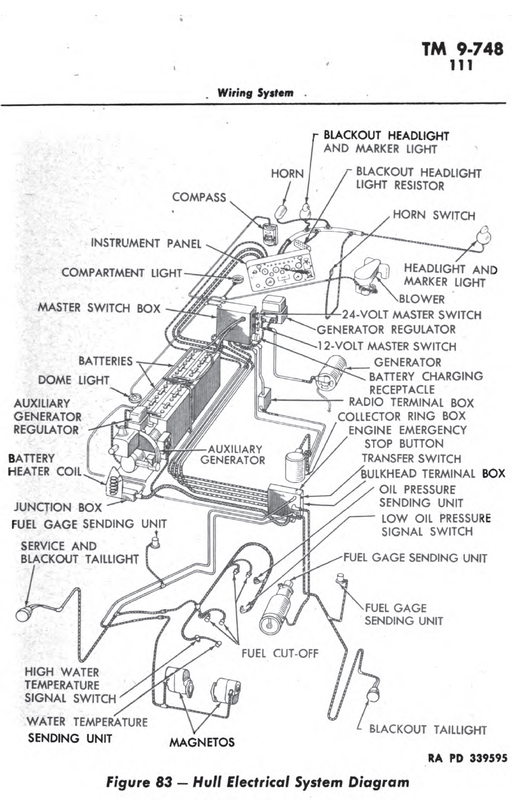 The Motor was a single cylinder like the Homelite, but it was a 4-cycle motor, the Homelite was a 2-cycle. The bore was 2 5/16 inches and the stroke was 2 1/4 inches. It ran between 2300 and 2550 rpm and made 1.6 HP at 2300 rpm. The Generator was 6 pole, and compound wound for starting, and shunt wound for generating. I assume it put out about the same amount of power as the Homelite unit, but the technical manuals I have do not state what it produced. The whole unit appeared to take up less space and maybe the aux generator they used in some wet ammo rack hulls. 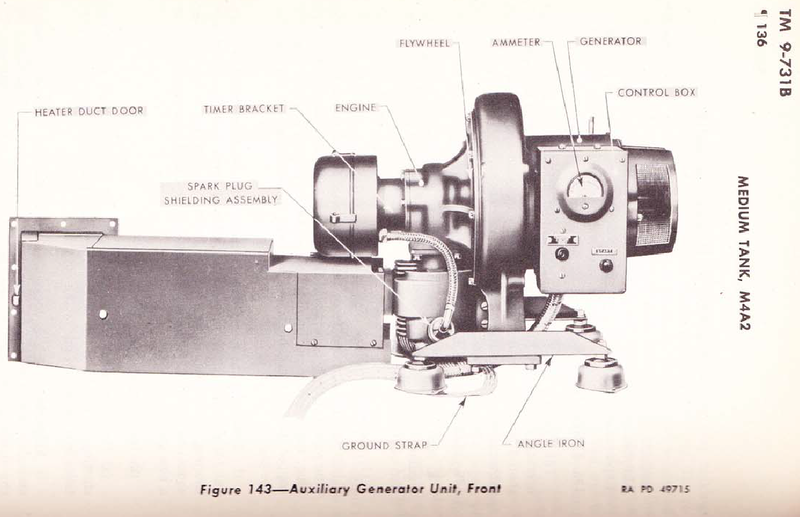 If anyone has more info on this Auxiliary Generator, please contact me! Both units had small fuel tanks in the engine compartment with their own filler caps. 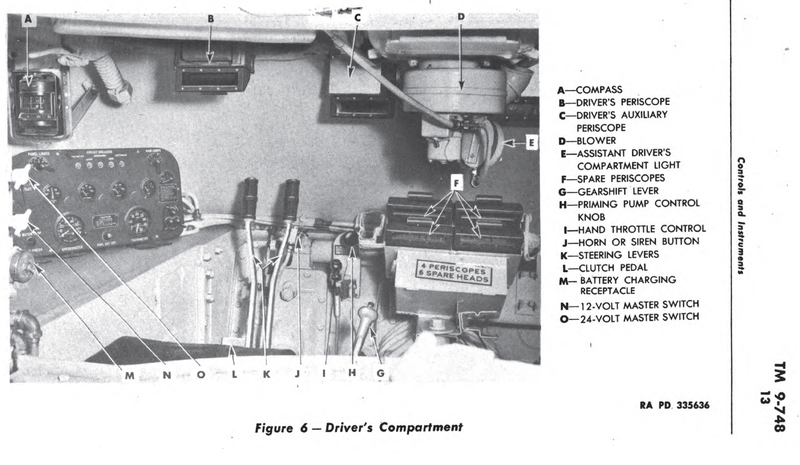 In some installs, the gas tank may have been partially mounted inside the crew compartment. I’m not sure if this version had an oil tank or was like the Homelite, that needed oil mixed into the fuel for oiling. I’m not sure why they used two different unit, the size probably had something to do with it, but it also could have been a supply issue, maybe like with the turret traverse systems, one maker couldn’t keep up? A little note on the Technical Manuals, you would think they would be standardized, and in some ways they are. The early manuals, like the ones on the Lee tank, and early Shermans seem to be much shorter than the later versions, and none seem to cover the tank in the same way. They all seem to have an inventory of what the tank should come with, and it’s really huge, and a section on how to drive and maintain the tank. 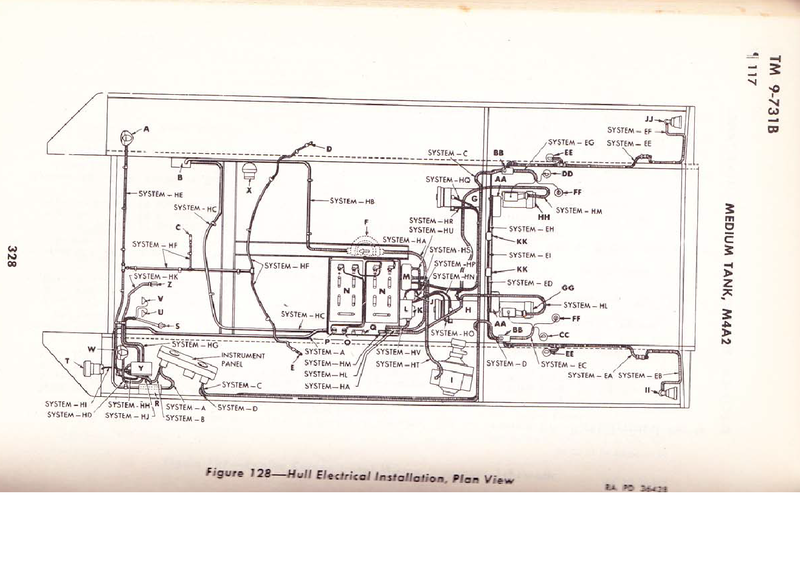 They all seem to have an electrical section, but what it actually covers varies. The M4A4 tech manual has a huge section on the motor, but nearly nothing on how to use the main gun. They do seem to get better as the Sherman aged, but the only late model manuals I have are for the M36B1 (TM9-748, TM9-745) and B2, and a horrible scan of the M4A3 manual(TM9-759). I have much better manuals for the M4A4 and M4A2 though. I really need a high-quality 9-759!